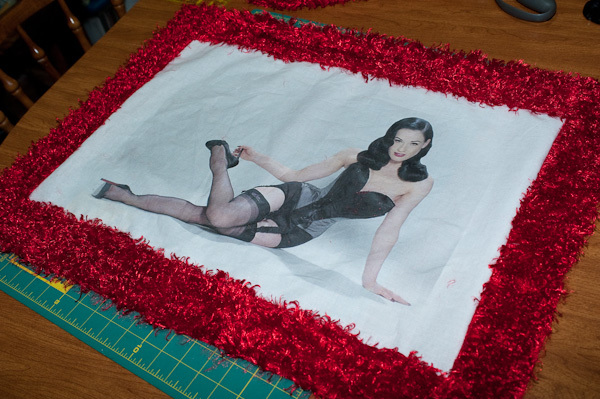 My daughter had a great crafty idea for a Christmas present for her boyfriend: pillows with a classic-style pinup photo printed on the pillowcase. Of course, none of the work for this project fell in her skill set. My wife Sandi had to do the sewing part, and I got to do the printing. If you search on the web you’ll find a number of sites that tell how to do this on small, dye-based inkjet printers. The instructions generally run: either soak the fabric with a product called Bubblejet Set, or a home-made recipe of soda wash and fabric softener (this is to remove the sizing and prepare the material to accept the dye ink); hang to dry; iron onto freezer paper (the freezer paper supports the fabric as it goes through the printer and will easily release the fabric after printing); rinse the printed fabric in water with fabric softener to set the dye, then hang to dry. 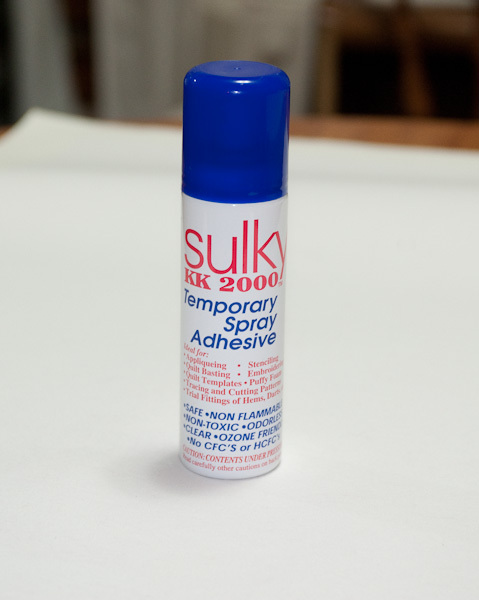 However, this did not work well at all with my pigment ink HP Designjet Z3100. When printing 24″ wide, the freezer paper is too flimsy and the corners catch on the printheads as the printer “reads” the material during the load process. Also, it allowed the large sheet of fabric to wrinkle on the paper itself (or the freezer paper wrinkled) causing big ink streaks. Another problem is that soaking the fabric in the pre-treat and then hanging it to dry didn’t leave the pre-treat evenly distributed on the fabric, so we got splotching and some of the pre-treat (with ink attached) came off the fabric. Most of all, with a pigment printer you really don’t have to do much to prepare the fabric to accept ink, or to set the ink for permanence afterward. 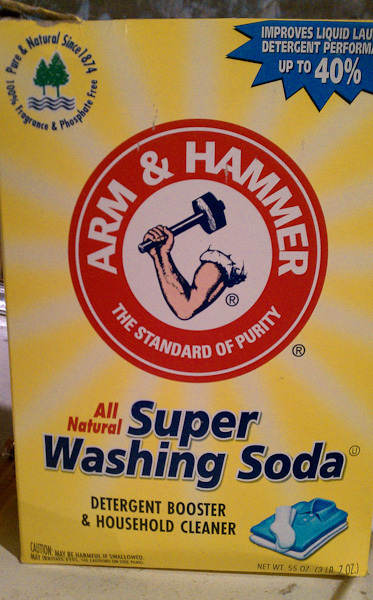 First, Sandi washed the fabric in the washing machine with a half cup of the washing soda and a couple of tablespoons of dishwashing soap. This removes the sizing and oils in the fabric. She let the wet fabric dry over a couple of bath towels. In the meantime, I worked on the problem of a firm support. The Z3100 printer is designed to handle thick fine art papers, and (unlike small desktop printers) it has a pretty straight-through paper path. It also does a very laborious check of the paper when you load it, to make sure the edges are straight and the paper loaded square, so you need paper that will lay flat and not curl at the corners (which the freezer paper did with fabric attached) and catch the print head as it checks the load. So I had a 24×30 sheet of Rives BFK laying around, and I trimmed a straight leading edge and two straight and square sides to assist the load. Sandi used some temporary spray adhesive to stick the dry fabric to the paper, allowing about an inch around the material. 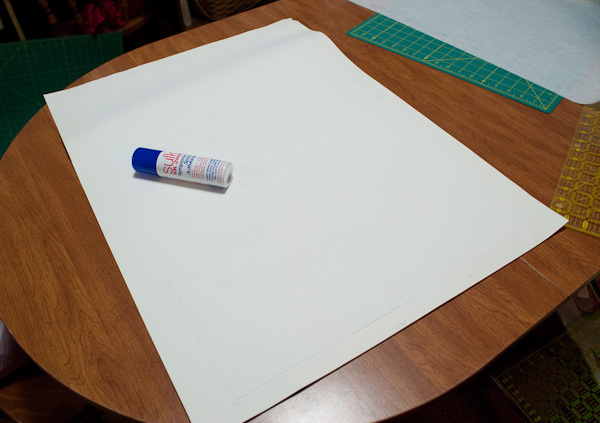 Sheet of fine art paper with fabric attached. With the stuff ready to go, I loaded it into the printer (it only gave me a little fit about loading, but I had no problems with corners catching or even the material lifting), and I slowly got an image out. On the HP I used the Fine Art paper >250gsm setting, and in Photoshop I set the images for 150ppi and let the printer control the color. The images we used came from the web (it’s a Christmas present!) and didn’t need a lot of resolution, although it appeared that upsizing the image 4x is about the limit. 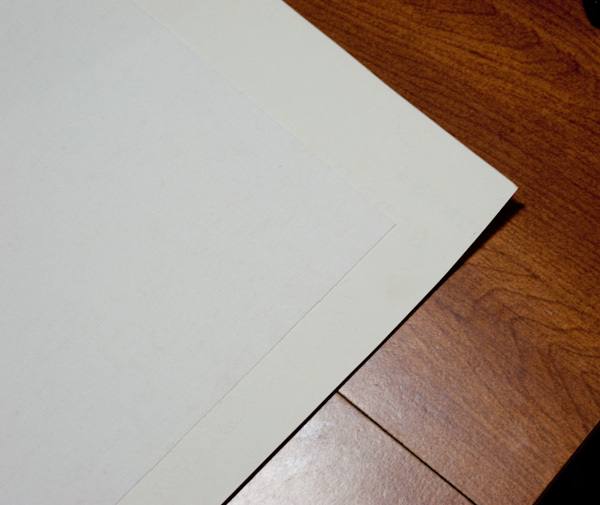 Be aware that your supporting paper will end up with a faint ghost image as the ink goes through the fabric, so don’t plan to use the paper for anything else. However, we had no problem using the same sheet for more than one printing, and as you can see from one of the photos upstream, this piece of Rives was not good and flat. But it was sturdy with a good leading edge, and the printer holds it flat as it proceeds through the machine. 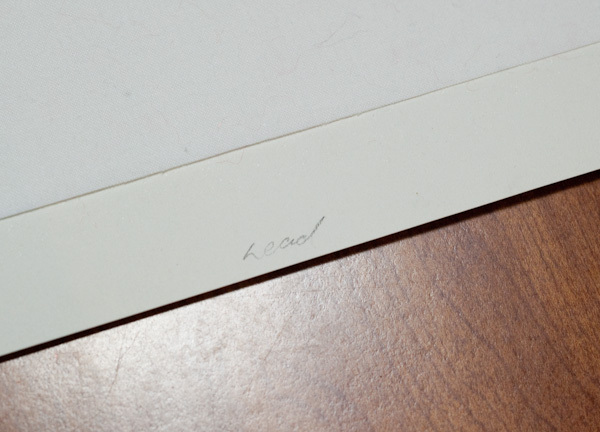 After printing, we let the print lay quietly and dry for about an hour, then Sandi removed the material from the paper and soaked it in a tray of water with a small amount of dish soap, simply to remove the spray adhesive. With the pigment inks, there’s no reason to set the ink. The soak to remove the spray adhesive. Nice to still get some use from old photo trays! After the soak and drying. The image loses just a tiny bit of color, which helped in this case to remove some tone from the background of the photo. Afterward, Sandi did her thing attaching the image to a fuzzy pillowcase, perhaps the messiest part of this entire project. We were sweeping up a LOT of fuzzy poodle fur! 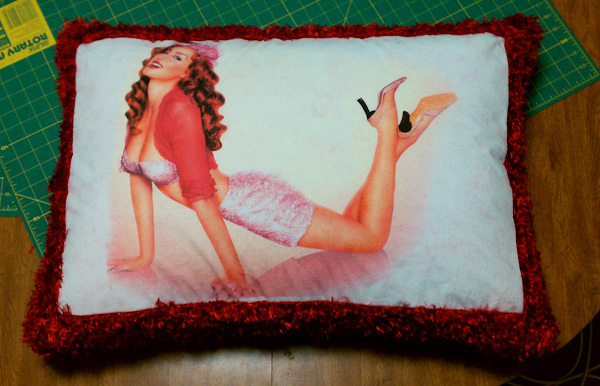 The pinup with some red poodle fur sides attached. The final result, waiting to be slipped over a pillow. So if you’re using a newer pigment (not dye) inkjet printer, and wanting to work on a big printer, you can let your imagination fly. The only limit here is the size of your printer and your images.